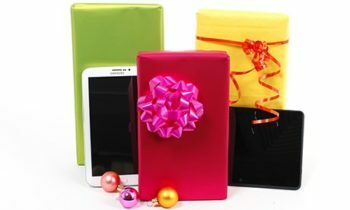 Christmas holidays are about to begin and this year is believed to be a tablet Christmas, these devices are to outset the personal computer sales for the first time ever. What are the top tablets? These are the companies that make good competition to the newly released iPad’s from Apple. Tablet computers have changed our lifestyles drastically: how we study, access internet, work and how we entertain ourselves. When the original Kindle Fire tablet was launched by Amazon – it did not make that much of competition to iPad and Galaxy tabs, but it does now. It is an android tablet, but unless other android devices – it has slightly adjusted and different operating system. It is designed to work perfect with media bought from Amazon – music, films, ebooks and so on. Screen is good, feels nice in hands and Speakers are decent. If you want the iPad look and features, but can’t afford Apple prices, Samsung devices become handy. At least they look great and feature quite similar design. But it does feel slower and clunky when you compare them to other (even android devices). It is rather difficult to type on them if you have anything bigger than a child’s fingers. They do get the job done for this price, and are sold in big numbers. The Nexus 7 tablet is one of the best of the 2012 mobile devices. It offers awesome tablet for the price of £159. The price has been lowered to £119 which is still a great value. Newer model has been released which is our top pick as well. The prices start at at £180 (at Amazon) for the 16GB version and it will cost you over £200 if you go for the 32GB. It features quite same built quality as iPad. Now the tablet comes with 2 cameras: front 1.2 megapixels and rear camera of 5 megapixels. The device is easy to use and the screen is flawless! If you consider getting this device for the people you care about – get the mobile spy on them to make sure that there is no inappropriate activities going on and that they are safe and sound!